Aubrey looks a little concerned...like she's worried a parrot is going to poop on her? Freaked out...that what Aubrey looks. A little freaked out. Maybe she realized how strange her parents actually are?! Aubrey was not freaked out at all. 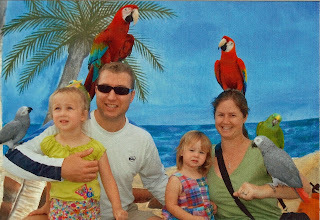 She was in the middle of asking if she could hold one of the birds when the shot was taken... not saying we aren't strange, just saying no child was freaked out in the process of this picture. I'd be worried about parrot poop on the top of my head. I love the picture, though!! Where is the big container of alcohol in the new one?? Is it possible that you and Doug are like a fine wine and get even better with age? You guys look great!